I definitely got my money out of this Zagi. I've been wanting to build a Zagi Tazz I bought two years ago but this one wouldn't die. Well I endless goofing around finally broke the motor tray and gave me an excuse to pull the gear out of it for the Tazz. 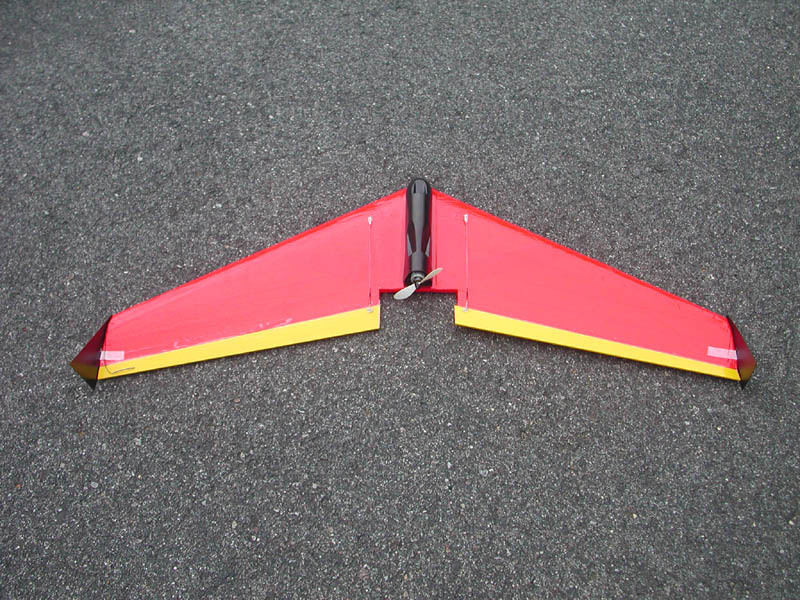 I gave the empty airframe to my friend Rich. We'll see what he does with it. 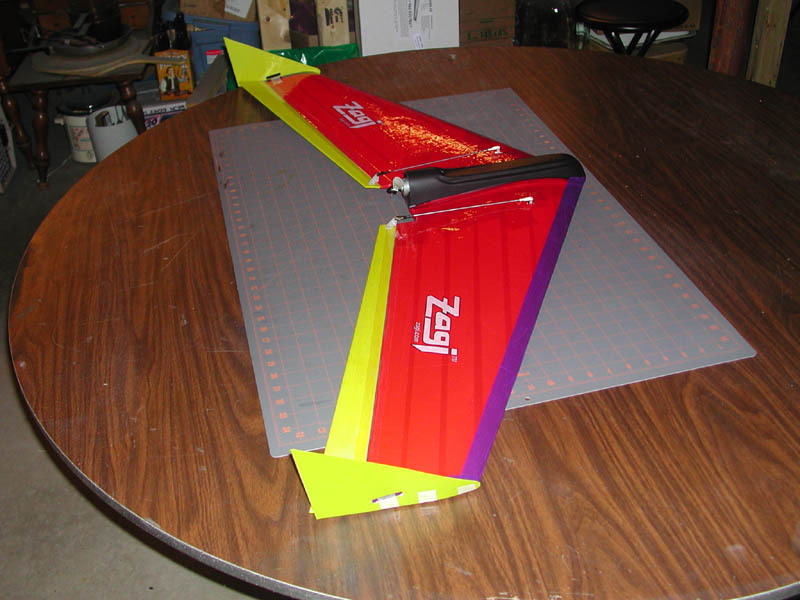 I've been flying the heck out of my trusty Zagi 400x trying to 'wear it out' so I can build my Zagi Tazz that I've had for almost 2 years now. 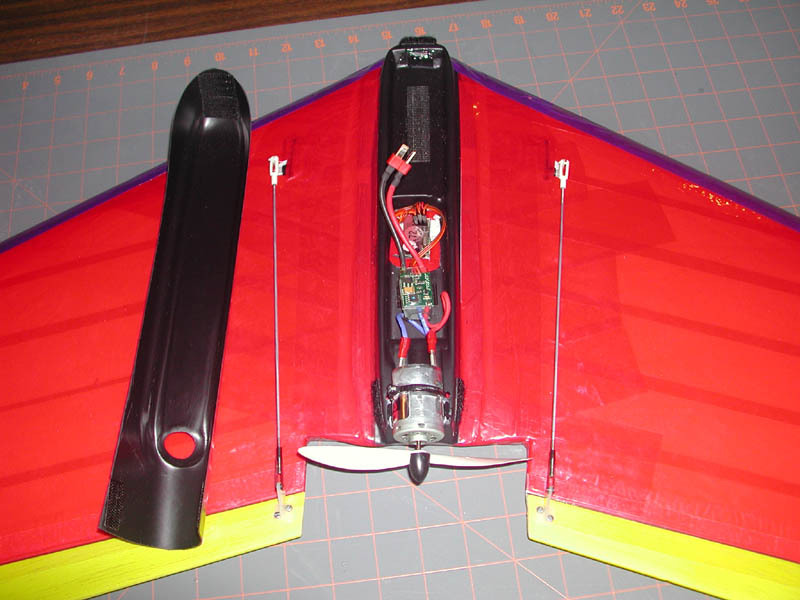 Putting an Aveox 1010/2Y (re-wound to 1.5Y) in it spinning an APC 6x4 prop on four A123 1100 mAh cells has really pepped up the plane making it a lot more fun than with the stock motor. The only bad thing is the plane just won't die no matter how hard I fly and abuse it! I guess that's nothing to complain about. I had to replace the poor disentegrated 400, so I bought some 400X cores and built one up. Much stiffer with the CF rod and flys great. My zagi had become soft and was doing the classic 'zagi flap' in dives so I decided to add a carbon fiber rod to stiffen it up. 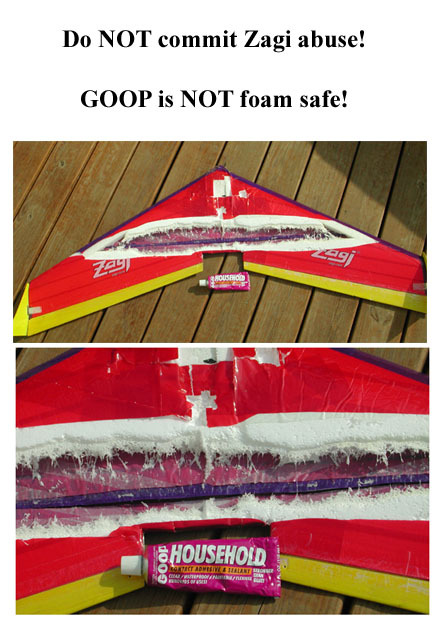 I've been using Goop on coroplast projects lately and decided to use it to glue in the arrowshaft, not knowing that Goop was more caustic than gasoline with a acetone chaser! Well after the glue was done eating my Zagi, there wasn't enough left to save it. I guess I'll need to order a new one now. I've given several people permission to use my abuse image (to the left) on their sites. If you see it elswhere, that's fine, just know that it was created here for use on this site, by me. Yeah, I'm THAT knucklehead. 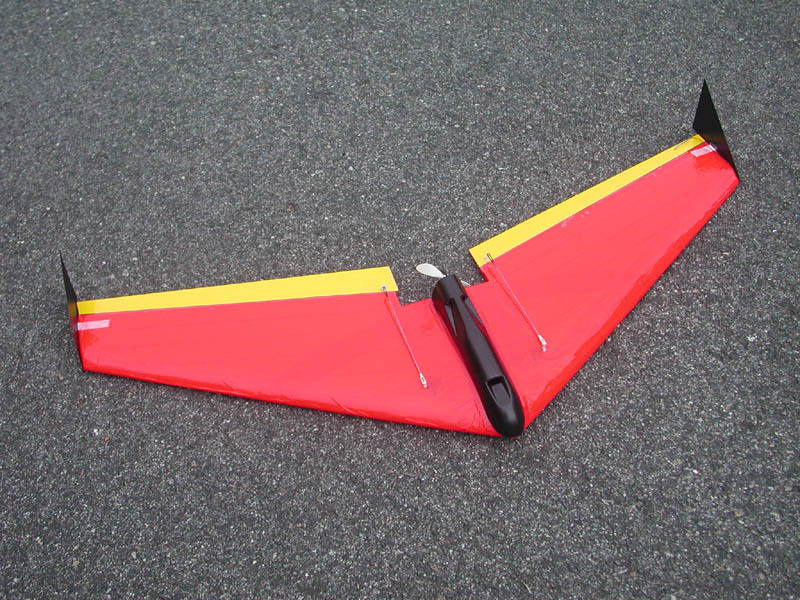 Had some great fun with the Zagi, doing Pylon runs at the club field. The Zagi is always good to go to when you've had a 'bad day' with your more fragile models. Flew on the holliday with a friend to show his nephew R/C. Wind was terrible and I ended up crashing and losing my receiver as it ejected and I didn't ever find it. No other permannet damange. Repaired by installing a new receiver which is more solidly attached. 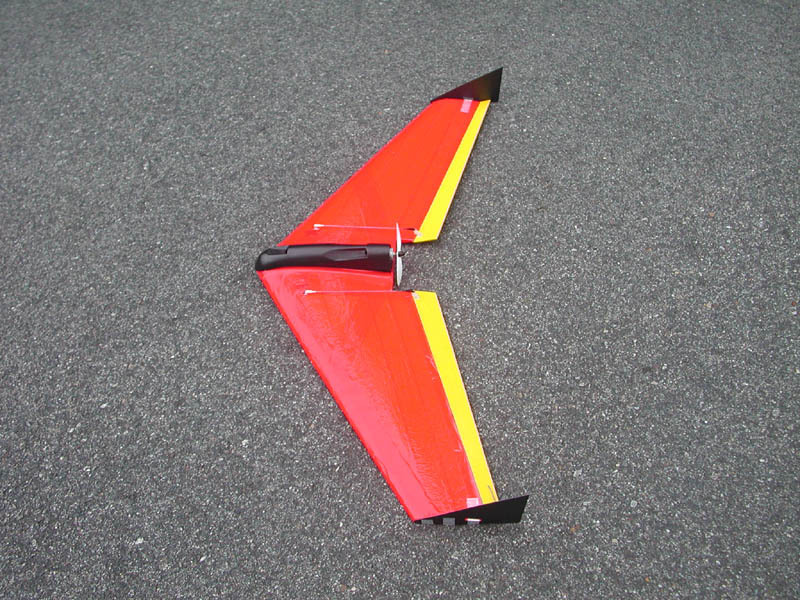 Winds were 10-15mph and I tried out my newly rebuilt Yard Bee but it was too windy for it so I flew the Zagi in front of a couple onlookers. At the end of the lunch hour I got a 'hit' while landing and bounced it. Chipped an elevon - field repaired. Went flying with my friend Robert, me with the red Zagi, him with his new green with orange trim Zagi - winds were 5-15mph gusting conditions. Both Zagis handled the wind great! True to Zagi toughness - repairs were easy and she flies great afterwards. 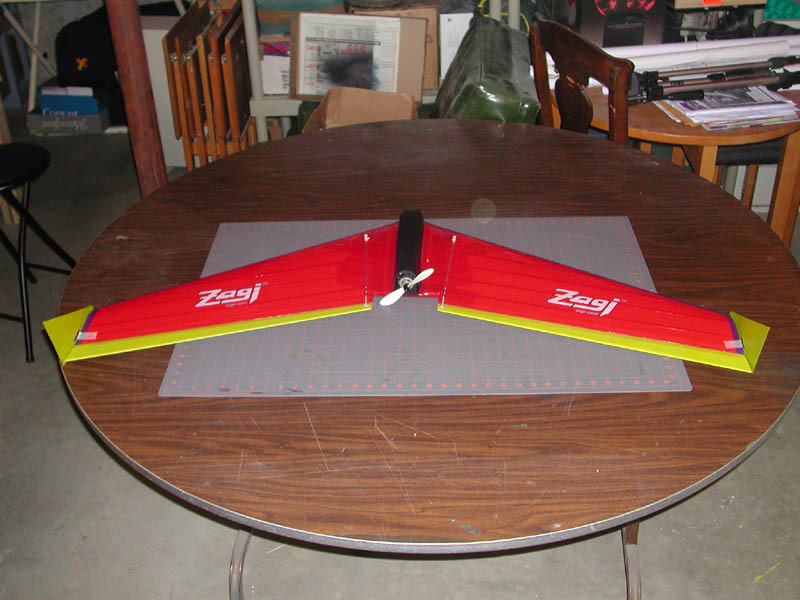 Stock Zagi 400 with 7-cell battery and speed 400 motor driving a Gunther prop. My battery packs of choice lately are 8x1600 AA NiMh packs made from Wal-Mart Rayovac batteries.